Are You Looking for HVAC repair in Utah? If you are looking for the most energy efficient way to heat or cool your home or office, we have just the right systems for you to choose from. Lee’s Heating and Air is a full service HVAC service Utah company with a team of certified and experienced technicians fully qualified to install and repair systems. When it comes to HVAC repair in Utah we are an industry leader dedicated to maintaining the highest level of customer satisfaction with our ever growing list of customers. How Exactly do These Systems Work? A hybrid HVAC system is just like a hybrid car which selects from two different energy sources to maintain the highest efficiency levels. A computer within the system selects either an electric heat pump or a natural gas or fuel oil powered furnace. These systems provide the greatest energy saving. In winter, it provides heat from an air-source heat pump that runs on electricity and features a refrigerant compound to direct heat from outside to inside. When it gets below freezing point, the fossil fuel furnace takes over. The control module is programmed to prompt the system to switch from heat pump to furnace heating. In summers, the cycle is reversed so that the heat pump provides air conditioning. 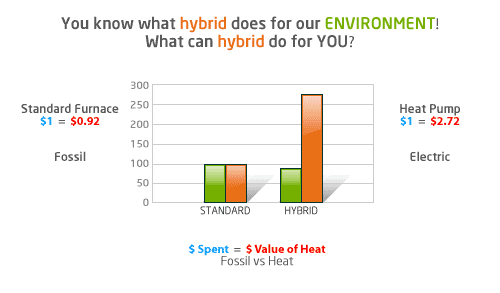 Hybrid heating and cooling systems do cost more than traditional systems. However, those extra dollars go a long way in helping you save as much as 30%-50% annually on HVAC costs. In a few years, this adds up to phenomenal savings, which is why many homeowners are now upgrading to hybrid systems. For more about the benefits, costs and savings just give us a call at Lee’s Heating and Air and our expert will inspect your home or office and provide an accurate estimate. When it comes to HVAC service in Utah, we have decades of experience in the industry in residential and commercial installation projects. Our technicians are experts in the installation of American Standard furnace and hybrid HVAC systems. Our systems and HVAC repair in Utah are guaranteed to provide you with the utmost comfort and energy efficiency, no matter what the season. All our installation and repair services are backed by our unparalleled guarantees. Apart from the highest quality installation and repair, we also ensure that you get the best price. After all, we are proud to be an American Standard Utah Dealer and pass savings and discounts on directly to our customers. Our technicians at Lee’s Heating and Air can protect your system with a strict schedule of preventive maintenance. We will conduct full system inspections on a regular basis to ensure that there are no clogged burners and ducts, worn parts, cracks, and loose fittings. This also includes regular servicing of all the components including the American Standard furnace so that your HVAC runs at its most efficient level at all times. You can count on Lee’s Heating and Air for excellent value, and of course, the services of the best technicians in the industry. That comes with old-fashioned customer service, something which has made us an industry leader. If you are looking for a reliable source to meet your needs, call us at 1-800-408-1561 and we will suggest the best ways to get the most out of your new system.